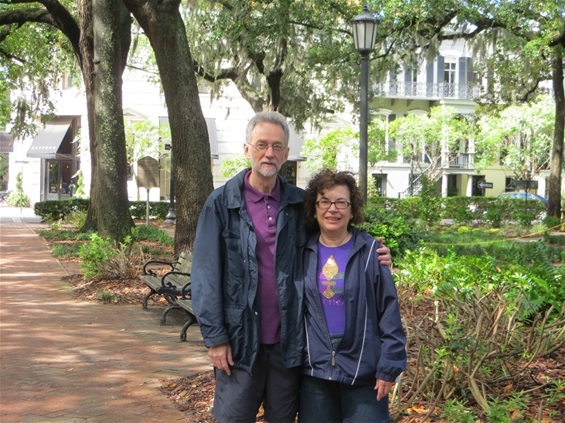 Cindy and I went to Savannah for the wedding of our nephew. The bride was beautiful. The groom was handsome. The parents beemed. Relatives from all over had a great time in a truly charming city. Savannah is astonishingly beautiful. Blessed with a lengthy growing season and a well developed civic sense of history and preservation its green spaces are abundant. Established in the early 1700's as a planned city, the square mile National Landmark Historic District (the largest in the United States) is a marvel of symmetry. Of the original 23 "squares" (common areas that were designed to serve the original colonial settlers) 22 survive today. 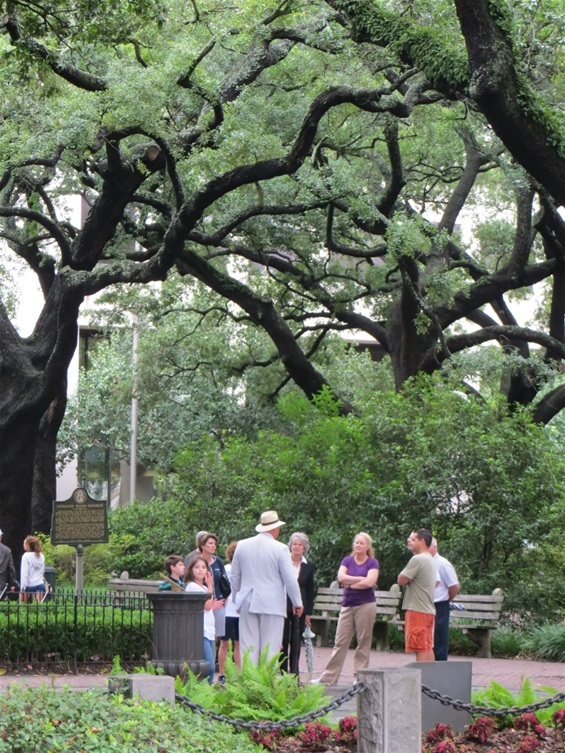 No longer the site of communal wells and markets, they are home to centuries old live oaks and provide cooling shade from what can be the oppresively hot Savannah sun. 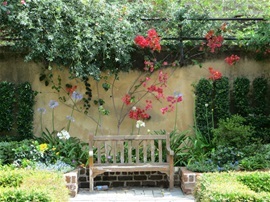 They make wonderful places to rest and enjoy the 18th and 19th century architecture that faces each square. It has not, of course, been unending leafy grandeur and Southern breezes. Savannah has seen visited by fire, hurricanes, yellow fever and the Civil War - each one of which nearly ended its existence. It is the birthplace of Juliette Gordon Low, the foundress of the Girl Scouts (groups of the Scouts are omnipresent) and Johnny Mercer, the great American songwriter ("Moon River", "Fools Rush In", "That Old Black Magic"). The SS Savannah, the first steamship to cross the Atlantic (1819) was conceived and funded by a group of Savannahians. Savannah refers to itself as "The Most Haunted City In America". It may very well be. But not in the way that people talk about. At its founding, the colony of Georgia prohibited slavery. Soon, however, the early planters saw the profits (from rice and indigo) their counterparts across the Savannah River in South Carolina were making through the use of slaves and political pressure ended the prohibition. With the invention of the cotton gin (at Mulberry Grove, outside of Savannah) in 1793, Savannah soon rose to prominence as the principal exporter of King Cotton - and the principal importer of the human beings that made that success possible, African slaves. Thousands of slaves - men, women, children - went on the auction block every year in the city. In the period immediately before the Civil War there were nearly 8,000 slaves in Savannah (about a third the total population). The largest auction (over 400 went on the block) of enslaved human beings in the history of the United States occurred at a racetrack outside Savannah in 1859. The financial success of The Most Haunted City in America was built, literally and figuratively, on the business of slavery. Many streets and squares bear the names of those whose fortunes were built on slavery. Homes of the founders of lucrative slave trading firms (there were dozens of these companies) still stand. Stately mansions, most notably the Green-Meldrim House (1853) and the Owen-Thomas House (1817) are monuments to the city's history. The Green-Meldrim House (see PHOTO section) served as the headquarters of General Sherman at the conclusion of his March To The Sea at the end of 1864. From here, Sherman sent his telegram to Abraham Lincoln, presenting the President with the City of Savannah as a Christmas gift. This was also the site of a meeting between Sherman and various black leaders of Savannah, resulting in Field Order No. 15, the so-called "40 acres and a mule" directive intended to address the issue of displaced slaves following the end of the war and the collapse of the Southern economy. Much of the offered land was located on the various barrier islands outside of Savannah and running along the coasts of both Georgia and South Carolina. Following Lincoln's assassination, this Order was revoked by President Johnson and the land intended for use by the former slaves was returned to its original owners, the slave holders. Today, this land is some of the most expensive real estate in the South and is the home of golf courses, beach resorts and gated communities. The Owens-Thomas House is an architectural marvel with indoor plumbing and design features not commonly seen for decades to come. It also displays one of the few remaining urban slave quarters. Essentially these were combination slave housing and stables found behind the main house across the alley (the "yard") that ran behind the period homes. In their day they provided shelter from the elements for the house slaves (perhaps 8 or 10 at the Owens-Thomas House). Today, when they exist at all, many have been converted to fashionable rental spaces. Inside the humble slave quarters a tourist, if they look close enough, will find a little (and exceedingly rare) photo of a slave "mammy" with one of her charges. This woman, identified only by her first name (a common practice of the times) is representative of the countless women who served as wet nurse, guide, protector, and dearly beloved friend of thousands of white children of the Olde South - children who grew up to enjoy all that beautiful Savannah had to offer. Sometimes the monuments of Savannah aren't imposing blocks of granite or bronze statuary. Sometimes they're just tiny - ghostly - images. I have always wanted to go to Savannah. Alot of history, it looks so beautiful.